Ramesh's father had bagged the contract for cutting of trees in the forest area for laying tracks as part of the Dallirajhra-Rowghat railway project and transportation of logs to the forest department's depot. 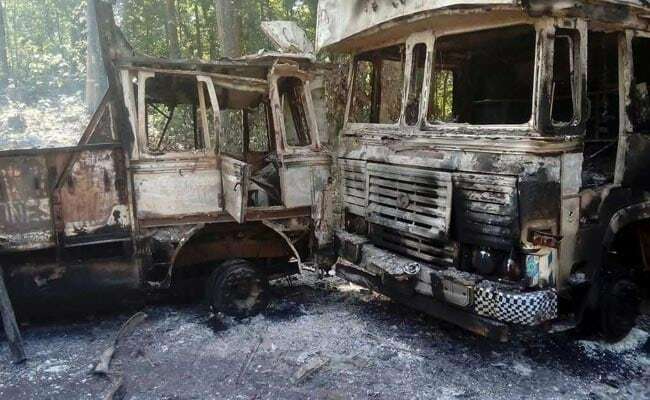 Naxals set fire to four trucks before taking the contractor's son with them. Raipur: Naxals have shot dead the son of a contractor whom they had abducted from a rail construction site in Chhattisgarh's Kanker district, around 180 kms from state capital Raipur. KL Dhruv, the Superintendent of Police in Kanker, said that the body of 38-year-old Ramesh Jain was found this morning at a forest near Rekhabat village. On Saturday, a group of 30-40 armed Naxals reached the construction site in the forest close to Rekhabat between Rowghat and Tadoki and asked workers to leave the place. They then set fire to four trucks and a loader machine engaged in the construction of railway line before taking Ramesh with them. "Later, they shot him dead in the nearby forest," Mr Dhruv said. Upon getting information, the SP and other officials reached the spot today and sent the body for postmortem. A search operation was launched in the region to trace the ultras, the police official said. The construction of Dallirajhara-Rowghat-Jagdalpur broad-gauge railway line, covering 235 km, would not only allow transportation of iron ore from the Naxal-affected area in north Bastar, but will also provide transportation facility to the people in the region. The work in the first phase, covering a 95-km route from Dallirajhara to Rowghat, is in progress with 17 kms of tracks upto Gudum commissioned for passenger train traffic. According to police, the Naxals have been opposing the project since its inception, fearing that the construction of the rail route will speed up the development work in Bastar thereby uprooting them from the region.